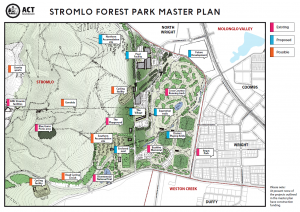 The Weston Creek Community Council welcomes the latest Master Plan for the Stromlo Forest Park. The new swimming pool would be a welcome addition for all residents of Weston Creek and Molonglo and the road cycling proposal around Mt Stromlo will make life safer for many cyclists who now ride on the roads but we need to ensure that other current users, equestrians, walkers, runners are not disadvantaged. Council does have concerns with overdevelopment taking away the open feeling of the park and would want to see the Bushfire Memorial not be an oasis in the middle of venues. Accomodation within the Park would also bring a greater use of a facility which is world class. The Gondola proposal is sure to attract much comment but it would enable a much safer trip to the top of Mt Stromlo for cyclists and those who would drive them up the mountain.